GREENCOAT® wax-alternative packaging manufacturer will attend sessions on food waste recovery, wholesale packaging, and paper foodservice packaging. Jeff Cormier, Interstate Container Cambridge Sales and Marketing Manager and Global Green Coalition for Resource Recovery (CoRR) Executive Committee member, will be present at CoRR Fall Resource Recovery Conference 2011 and the 12th Annual Sustainable Design Awards on 14 - 15 November in New York City. The 2-day event will cover the latest trends, innovations, and technologies in recycling foodservice packaging and sustainable packaging designs, as well as CoRR’s 2012 pilot program promoting wax-alternative boxes. Furthermore, the members-only ‘Wholesale Packaging’ session will discuss wax-alternative boxes, pilot processes and lessons learned, as well as upcoming pilot programs for 2012. The session aims at accelerating development and building demand for recyclable produce and wax-alternative wholesale packaging. Interstate Container Cambridge manufactures GREENCOAT® wax-replacement cartons. GREENCOAT® is an award-winning recyclable, repulpable and compostable corrugated box for packing bulk poultry, meat, seafood, fresh produce, and floral products and other applications requiring eco-friendly water-proof packaging. The wax-alternative box meets the performance standards of waxed boxes, provides proven moist condition tolerance and saves customer disposal fees. The CoRR conference aims at accelerating the development New York’s food waste recovery infrastructure and cost-effective recyclable box solutions. 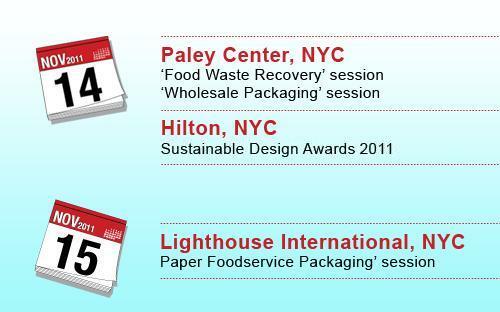 The conference also aims for foodservice packaging to be recycled into valuable, high-quality materials. Global Green's Sustainable Design Awards 2011 will highlight great innovations and honor leaders working to protect the environment. CoRR honored Interstate Container Cambridge with the 1st Pioneer Award for its GREENCOAT® boxes at last year’s 11th Annual Sustainable Design Awards.